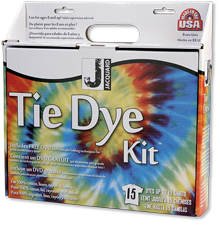 This is the original Tie-Dye Kit developed in 1990's and still hands down the best kit on the market! This easy-to-use kit features Procion MX fiber reactive dye, a concentrated dye that produces exceptionally brilliant color on any non-synthetic fabric. Each complete kit includes supplies to dye up to fifteen adult T-shirts: instructions, dyes in fuchsia, turquoise and yellow, soda ash dye fixer, rubber gloves, rubber bands and an extra bottle for mixing pastels or secondary colors. The dye is in powder form in large plastic squeeze bottles. Simply add warm water to dissolve the dye and it’ s ready for use or for mixing new colors. The instructions describe and illustrate all the steps, including four tying techniques that produce different explosive patterns.